Prosthodontists are dentists who specialize in the aesthetic restoration and replacement of teeth. They can help restore optimum function and appearance to your smile. At Sterling Dental Clinic, we help you get back your healthy, beautiful smile. Our team offers a full spectrum of cosmetic and restorative dental services including crowns, dental implants, porcelain veneers, teeth whitening and more. Whether treatment requires delicate enhancement by bonding, whitening and straightening or demands more complex procedures, we have the perfect tools to provide you with the personalized care that you deserve. Dental crowns are ‘caps’ that cover your natural tooth made to fit snugly at the gum line to protect the remainder of your tooth. Not only can crowns cover decay or cracks, they can work together with dental bridges to help hold a replacement tooth and cover dental implants. We use crowns made from porcelain and can match a crown to the exact color of the surrounding teeth. The benefit of a porcelain crown allows for a more natural looking solution for functional and aesthetic tooth problems. Your restoration will be virtually unnoticeable. Why Visit Sterling Dental Clinic? Our prosthodontists are highly trained in state-of-the-art procedures and techniques for treating various dental conditions and restoring smiles. These include: Bridges, crowns, veneers, removable and complete partial dentures, traumatic injuries to the mouth’s structure and/or teeth, dental implants, and sleep or snoring disorders. 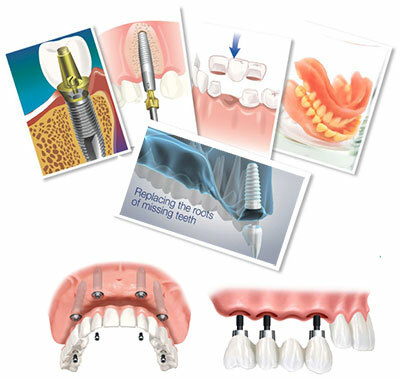 If you are interested in Prosthodontics or would like to schedule an appointment, please don’t hesitate to contact us. One of our friendly team members will be always happy to assist you. When you trust your mouth and teeth to our Prosthodontists, you can be rest assured that you will receive the best quality care from true professionals with the necessary experience and training to provide your treatment.